The fourth annual Arizona Food and Farm Finance Forum will be held on May 18-19, 2017, at the University of Arizona’s Environment and Natural Resources 2 Building in Tucson, Arizona, with the aim of influencing the way Arizona feeds itself and does business locally. The event is presented by Local First Arizona Foundation, a statewide organization focused on community and economic development in order to build self-sufficient, healthy and prosperous communities. The first Forum, held in 2013, was hosted at Biosphere 2 in Oracle, Arizona. Since then, the Forum has traveled to Phoenix and the Verde Valley, and is now returning to the southern Arizona. This Arizona Food and Farm Finance Forum will focus on bridging the gap between local food entrepreneurs and both private and public opportunities for investment. Attendees will have the opportunity to learn from leaders in their field and network with others in their industry. “The overall goal will be relationship building and setting the stage for coordination and cooperation across Arizona’s local food system,” said Lanning. The event is open to anyone interested in Arizona’s local food economy, including food producers, buyers of local food, food manufacturers, financial institutions, farmers market organizers, CSA organizers, agribusiness developers, beginning farmers and ranchers, local governments, policy makers and elected officials, local food organizations and nonprofits, and students. A series of breakout sessions will provide opportunities to learn about a variety of topics related to Arizona’s local food economy, including marketing, outreach and branding; business planning, access to financing and grants, developing relationships between buyers of local food and producers of local food, the regulatory environments that affect local food production and local food business development, resources that exist for local producers and food system participants. “The event will be an exciting way to learn about and put into practice, strategies to expand and enhance local food businesses and connect with other key players in the state’s local food movement,” said Lanning. Educating Arizona’s local food entrepreneurs is an important goal of the Arizona Food and Farm Finance Forum, but another theme of the event is building relationships. “The breakout sessions will provide networking opportunities between producers and buyers, and we hope to spur conversation amongst buyers and producers about specific ways local food can be incorporated into more purchases,” said Lanning. The Food and Farm Finance Forum will host Anthony Flaccavento as a keynote speaker. 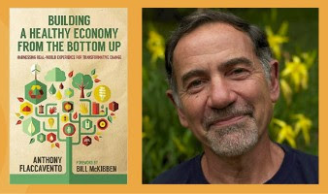 Flaccavento is an organic farmer in the Appalachian region of Virginia and author of Building a Healthy Economy from the Bottom Up: Harnessing Real World Experience for Transformative Change (University Press of Kentucky, 2016). His consulting business, SCALE, Inc, works with communities around the world to help build more locally-rooted, sustainable economies and healthier food systems. Flaccavento was the founder of Appalachian Sustainable Development and a number of other ‘social enterprises’ over the past three decades. He writes and speaks regularly about the economy, food and farming, sustainability, rural development and politics. His YouTube channel, “Take Five with Tony,” covers many of these same topics in down-to-earth, five minute segments. Registration for the two-day event is $99 per person, or attendees can choose to attend just one day for $59. Speakers and programming will be announced on a rolling basis. Registration and more information is available at http://localfirstazfoundation.org/azfoodforum.